It makes me question why suicide, mental health issues, drugs and alcohol are all such problems in the Culinary Industry. What is it about the culinary environment that is making chefs and others in the industry feel like there is absolutely nothing to live for or that they have to drink or take drugs constantly to escape from it? Is it the hours? Is it the pressure to always turn out perfection on each plate? The desire to move up in the culinary world? 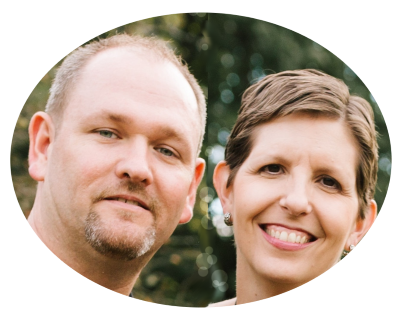 The lack of time and energy to talk and debrief with someone who cares and will listen? The lack of time to take care of themselves physically? The difficulty processing and getting over bad YELP reviews? I can’t be the only wife, girlfriend or significant other in the restaurant industry that is struggling with these questions today. How can we support our chefs from home? We are always there to listen, but I know from experience that finding time to listen and talk can often be hard. Our schedules are opposite. The kids are always around. We are tired. They are ALWAYS tired. The day to day things that need to be talked about tend to come first. It’s hard to find time to communicate about the everyday things, let alone more serious things. How do we find time to REALLY TALK! I wish I had the perfect solution, but it’s going to look different for all of us. Anthony Bourdain’s suicide today needs to be a wake up call for all of us to FIND THE TIME NO MATTER WHAT IT TAKES! How are things going at the restaurant? What are you really enjoying about your restaurant right now? What are you really hating about your restaurant right now? Is there anything you are frustrated about right now? How are your other chefs and line cooks doing? How is the GM? How are the owners? How is your relationship with the Lord? When was the last time you were able to spend time reading the Bible and in prayer? When was the last time we let them know that while we might not understand everything, we will always be there to listen…to let them know they can always confide in us and know that what they say will be safe with us and that we will not tell others? We need to ask these questions because we love them more than anyone else in the world! They are our best friends and we can’t imagine life without them! If they are struggling, we want to know and share the burden with them. Now please don’t start reading into what I’m saying and thinking that those close to Anthony Bourdain somehow missed all these signs that he was struggling and that if they had talked to him more they could have prevented his death. That is not what I’m saying at all!! Suicide is often a surprise to loved ones and is always devastating to those who they leave behind. 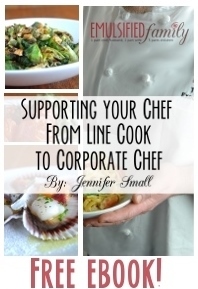 I just want us to think about how we can continue to support our chefs! That’s it. 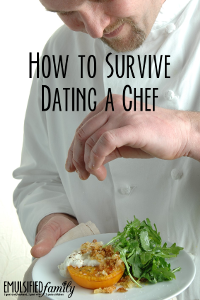 And to turn the table for just a minute….CHEFS…you should probably also ask some deep questions of your wife, husband, girlfriend, boyfriend…we can get pretty lonely at home with your long hours. 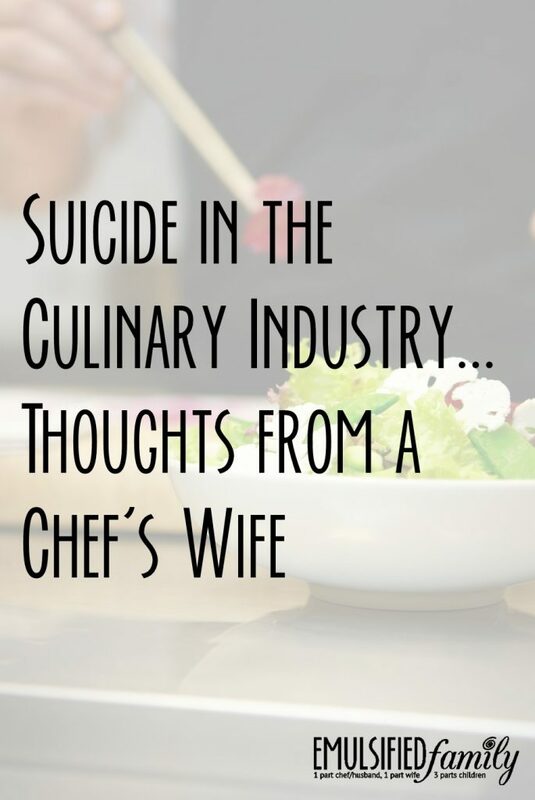 Stepping out of the culinary industry….it also makes me stop and wonder how many of the “friends” I follow on Instagram and Facebook appear happy, but are really struggling with depression. How many are struggling to even get up in the morning? Maybe it’s time we pick up the phone to call someone and see how they are really doing instead of just checking their status on social media. I would love to know your thoughts in the comments below on how you as a chef deal with the stress of work, or how those of you at home help them deal with it? If you’re thinking about suicide, are worried about a friend or loved one, or would like emotional support, the Lifeline network is available 24/7 across the United States (1-800-273-8255). Or in the UK 116 123. Also, I respond to every comment on my blog and every email. I am always here to “listen” via email! Very insightful. I’ve been thinking about Anthony Bourdain all day. We would watch his journeys once my chefhusband arrived home. My heart breaks for his daughter. Having a young daughter ourselves, I know how much she looks up to her daddy. Just like his daughter, ours is a tough critic too. My daughter struggled when mine was training out of the state and country. This lifestyle takes a toll on the kids as well. My heart aches for his daughter so much today. She’s so young. My husband wasn’t happy in a former position and did all he could to find something that would make him happy. My heart and head have been surrounded with this tragic news today. We have 3 young girls as well. I can’t imagine how hard this must be on her! Not just losing a father, but a famous father…so news of it is everywhere! 🙁 So hard!! No depression here. My Chef is always pretty hyped up and enlivened by work, but he has options. He only works when he wants to and for things he wants to. That’s a whole different ball game to the mind numbing, interminal slave to the job thing. He used to work for us, to buy a house, to buy the dream, then we realised the dream was an illusion. Very glad we broke out of that hamster wheel. He’s doing a whole 5 weeks this summer to help save for our K2 trek. I wish more people knew that there are other ways. Such a shame about Bourdain, what a man. A true icon of our time. Thanks Alyson. A whole 5 weeks! Nice! Great read! I am a chef who had met Anthony back in the early 90’s and I am taking this harder than I would have expected. After 35 years in the industry there is nothing else I would want to do. But there is nothing else I can do at this point either. 35 years is a long time! So sorry to hear you are taking it so hard. I think for so many, we feel like we knew him as his books and shows drew us in. Hi Jennifer, I can relate your topic. it’s a great article. Thanks for sharing!